I made a curry a while ago that called for a couple of tablespoons of dessicated coconut. As you can’t buy just a couple of tablespoons of dessicated coconut, the rest of the massive, opened packet has sat in the cupboard ever since, waiting to be thrown out in the next Great Clear Out, sometime in 2012 or 13, probably. Instead of just letting that happen, I decided to do the right thing and hunt out a recipe that made use of dessicated coconut. (really, everybody should own this book). It’s quite an unusual cake, with a little twist that only becomes apparent when you turn the cake out at the end. Start by mixing 250g of dessicated coconut and 250ml of orange juice together, letting the orange juice soak into the coconut for a good quarter of an hour. The coconut should have started to soften slightly. Separate six eggs and add the yolks to the coconut, along with 300g of golden caster sugar and four tablespoons of sunflower oil. Beat the egg whites until they’re at the ‘you can hold the bowl upside down over your head and not end up in a mess’ stage, then gently fold them into the coconut mixture. Pour the mixture into a well greased, non-stick cake tin and bake for forty-five minutes at 180c. Let the cake cool a little and then turn it out, upside down, onto a plate. A base of creamy egg will have formed on the bottom of the tin as the mixture has sunk and separated, and this base will end up on top of the turned-out cake. If you’re lucky, the egg might have scorched a little to give a bit of crispness. The finished cake is very light and crumbly, and it feels unusually healthy for a cake, probably because it hasn’t got any butter in it. Coconut counts as one of your ‘five a day’, right? This is such a lovely looking cake! I have half a bag of coconut leftover from making granola bars a while back, great suggestion! I have never really been a coconut fan, but a few years back a friend of mine made a coconut cake for my birthday. I didn't have the heart to tell her that I didn't like coconut, so I just ate it. And I loved it!! Since then I can't get enough coconut recipes! I really like the orange/coconut combo you've got going on here. I'm eager to give this one a try!! Looks wonderful! I love anything with coconut! OMG – I am so making this. It just looks amazing, and I love the coconut and orange combination. It definitely seems pretty healthy to me, with no butter and no flour. What an inviting cake! 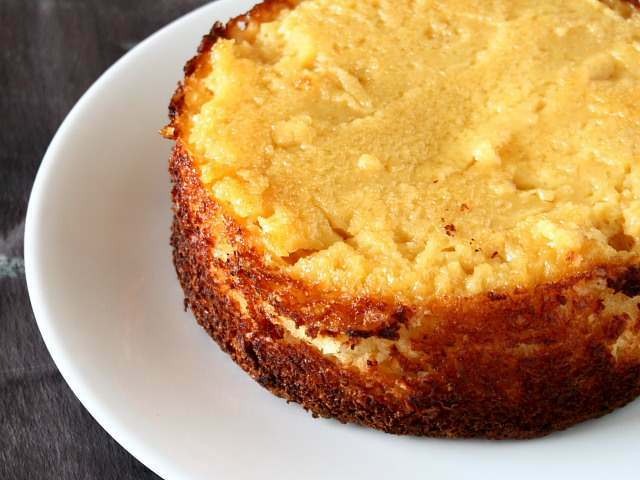 I adore coconut and the deep yellow of your cake with the crispy edges looks wonderful! You had me at orange and coconut! YUM! I know what you mean about have a lot of extra… this is a great way to use it up! I also freeze mine. I've never seen a Moroccan dessert before – so interesting to learn about it! Looks delicious! This looks like a really good reason to buy some coconut! I have a mountain of oranges that now have a destiny to fulfil, thanks! that looks lovely. I like this take on a classic. This cake looks delicious! Yum! Orange and coconut – that's a real yummy combination! It looks beautiful! This looks delicious…with such a pretty crust around the edges. I adore a good coconut cake. That looks to-die-for good! I love any kind of coconut cake, but I have never seen one made without flour. I love coconut and this looks fabulous. Almost like a coconut quiche! I'm not a big coconut person but this sounds amazing. I love the idea of it. I love the fact that it's soaked in orange juice. Wow, wow. I think I just have to make it to see if it's as good as it looks. Thanks for sharing. You had me at coconut and orange juice. Interesting! What size cake tin did you bake this in? I also have some coconut that I need to use up! It was 18 or 20cm, I think. The crust looks perfect. Great work. Just made this. It is indeed an unusual cake in the traditional sense but extremely yummy and got a big thumbs up from my family. Thank you. Looks good! sending some buzz! How long should it keep ? …lasts a few days, and yes, I’d probably refrigerate it.